President-elect Donald Trump has been assembling a national security team stacked with fierce opponents of last year's comprehensive nuclear deal with Iran, signaling what is expected to be a major departure from the Obama administration's final bid to preserve the deal before leaving office, according to multiple sources familiar with Trump's transition plans. Trump has been installing well-known opponents of the deal to key national security posts for the incoming administration, including at the White House National Security Council, the CIA, and the Department of Defense. This includes his selection of retired Marine Gen. James Mattis as secretary of defense, Rep. Mike Pompeo (R., Kan.) as CIA director, and retired Army Lt. Gen. Michael Flynn as national security adviser, picks that have won plaudits for their vocal opposition to the nuclear deal. "It's no secret that Flynn considers Iran to be the linchpin of a global alliance of hostile rivals seeking to undermine American interests," said once source familiar with the backroom talks about future national security picks. "He was in the Middle East during the Iraq war and knows first-hand how Iranian proxies killed hundreds of American troops, and he has seen the intelligence showing that they've targeted Americans around the world." "As long as Iran keeps acting like an enemy of the United States, his NSC will accurately convey that to the president, and he's building a staff that will make sure of that," the source added. Other recent national security picks include KT McFarland, a longtime national security analyst and commentator who has vocally criticized Iran and the nuclear deal, and Yleem Poblete, who served for nearly two decades as a senior staffer for the House Committee on Foreign Affairs. A senior congressional aide familiar with Poblete's work on key national security matters told the Washington Free Beacon that Trump's picks would not back down from a showdown with Iran as it continues to fund terrorism across the Middle East. 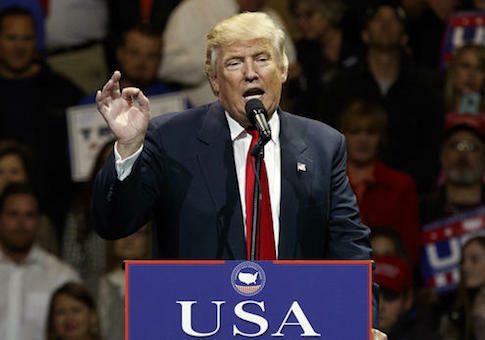 "It's apparent that President-elect Trump is taking a fundamentally different approach to national security and foreign policy than the current administration," the source said. "Selecting Rep. Pompeo to head up the CIA, General Flynn as national security adviser, and General Mattis as defense secretary shows that the new administration will not recede from the world stage as the current administration has done, but is willing to reestablish America as a global leader." The source said that Trump's selection of Poblete is a sign that the next president is serious about rewriting America's policy approach to Iran and other rogue regimes. Selecting Poblete for the NSC landing team sends a clear signal that the next administration is looking to reverse some of the damage that President Obama has inflicted when it comes to Iran and Cuba and will legitimize and improve the totality of Trump's foreign policy agenda," the source said. Poblete played a key role in crafting sanctions against Iran and was the senior staffer on the Foreign Affairs Committee when they were initially signed into law. "Poblete is a tough negotiator with the policy chops to advance U.S. national security interests; her vast experience of being one of the main architects of the current sanctions against Iran, her advocacy for freedom and democracy in Cuba, her ardent promotion of transparency and reform at the UN, and her vast experience and expertise with the Middle East will no doubt help strengthen our relationship with Israel," the source explained. Trump's selection of these foreign policy heavyweights comes as Congress overwhelmingly voted last week to extend economic sanctions on Iran for 10 years, a move that elicited an angry response from Tehran. With Poblete, Flynn, and others steering the ship, the Trump administration is expected to go even further with new sanctions on Iran for its behavior, which includes testing advanced ballistic missiles and threatening actions in the Persian Gulf. The next administration will likely have to unwind the Obama administration's final push to provide Iran with continued sanctions relief and cash payouts. "The Obama administration has 48 days to try and nail down the deal to make it more difficult for the Trump administration to negotiate a follow on agreement that addresses the fatal flaws of the Obama nuclear deal," Mark Dubowitz, executive director of the Foundation for Defense of Democracies, told the Free Beacon. "Anything they try to do will be at the top of the chopping block when the new administration gets into their seats." This entry was posted in National Security and tagged Donald Trump, Iran, Iran Nuclear Deal. Bookmark the permalink.